It was in the year 2000, that the Nagaland government embarked upon an ambitious project to promote the cultural aspects of Nagaland, through a weeklong long festival to coincide with the celebration of Nagaland Statehood Day on 1st December. This led to the beginning of the Hornbill festival; which is now one of the biggest cultural extravaganzas in the North East. What emerged from a local event has now transformed into a national and international festival. It has become a must visit and notable attraction for those looking to explore the North Eastern part of India. What is the Hornbill Festival? 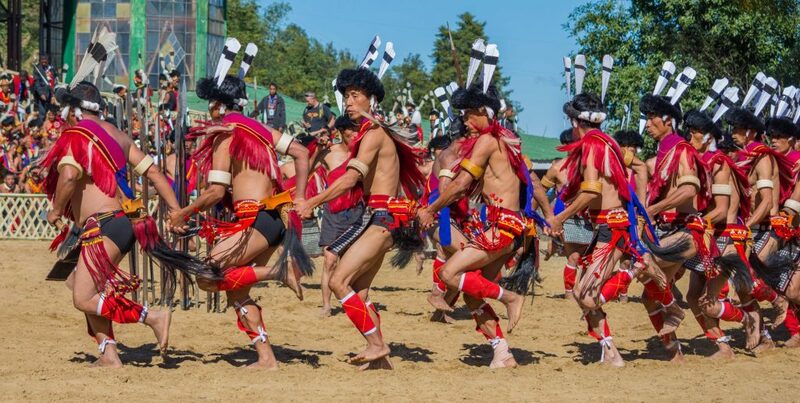 The Hornbill Festival is one of the biggest cultural extravaganzas in the region and is a week-long event held every year from Dec 1-10 in Nagaland. The objective of the event is to revive, protect, and promote the richness of the Naga traditions. During the event, the Naga tribes come together for a week-long celebration of their cultural and traditional plight, their age-old traditions and come closer to knowing each other. The main events of the festival take place at the Naga Heritage Village, Kisama. It is located below the lofty spurs of the towering Mount Japfü and about 12 km from Kohima city. It begins at 9 am each day. There are plenty of taxis operating to Kisama from Kohima. You can buy tickets to the event at the Entry Gate and do make sure you get a pass for parking as well. Suggested Read - Traveling through Sikkim. All you want to know! The Festival is not just about reliving past, it is also a celebration of the present. The biggest Rock Festival of the country is hosted at Kohima every year during this festival. It is believed that singing and dancing is a way of life and comes naturally to the Nagas. And the biggest rock event is no doubt a part of the vibrant Hornbill celebrations. Apart from this, an adventure car rally and various other contest and events are organized during this festival. Some interesting events during the festival are – the Pork eating contest, the King Chilly eating contest etc. The event is full of activities such as cultural performances, indigenous games, craft bazaar, music events, fashion, cycling, motor sporting, events, a kids carnival, floral galleria, food courts, film festival and a series of competitions in various activities. Suggested Read - The complete guide to Tawang Festival! Suggested Read - Great things to do in Kalimpong! The festival is one of the top tourist attractions in the state and is thronged with people from all over the world. Therefore, make your bookings well in advance to avoid any last minute hassles and inconvenience. Do bargain at the various eateries, souvenir shops, and other stalls as it can always fetch you a good cost. Foreigners are no longer required to possess the Entry Permit to visit Nagaland. However, they must register themselves with the Foreigner’s Registration Office (District Superintendent of Police) inside of 24 hours of their entry into Nagaland. There is a very helpful Information Center located near the festival site from where you can have the brochure which lists the festival events and other attractions in Nagaland. RAP/PAP is still a requirement for Pakistani and Chinese nationals. Kohima has a very good road network and connects to the neighboring states and nearby cities. National Highway number 39 link Kohima to Meghalaya, Arunachal Pradesh, Tripura, Mizoram, and Manipur. First, proceed to Dimapur and then travel to Kohima. From Kohima, you can hire a taxi or take a bus to Kisama. Kohima does not have a Railway Station of its own because of its tough hilly terrain. The major railhead in the state is in Dimapur, which is connected to the important towns of Guwahati and Kolkata. Kohima does not have an airport of its own but the state has its airport in Dimapur, which is regularly serviced by major airlines. The city is linked to Kolkata by air with Air India and Indigo Airlines operating the flights. Since Kisama is just 12 km from Kohima, you can book your stay in the city unless you find a good tent accommodation near the festival grounds. There are a plethora of good hotel options and you can review these on most travel sites. However, if you are looking at staying on the festival grounds you can try ChaloHoppo or TUTC for booking options. I’m saving this guide for my next trip to North East, Hopefully it will be soon! Great post. Thanks a lot for reading and leaving our comment. NE is beautiful and we are sure you will love it.